The British painter Michael Ashcroft works with the idealism of images and our love of nature and the landscape. 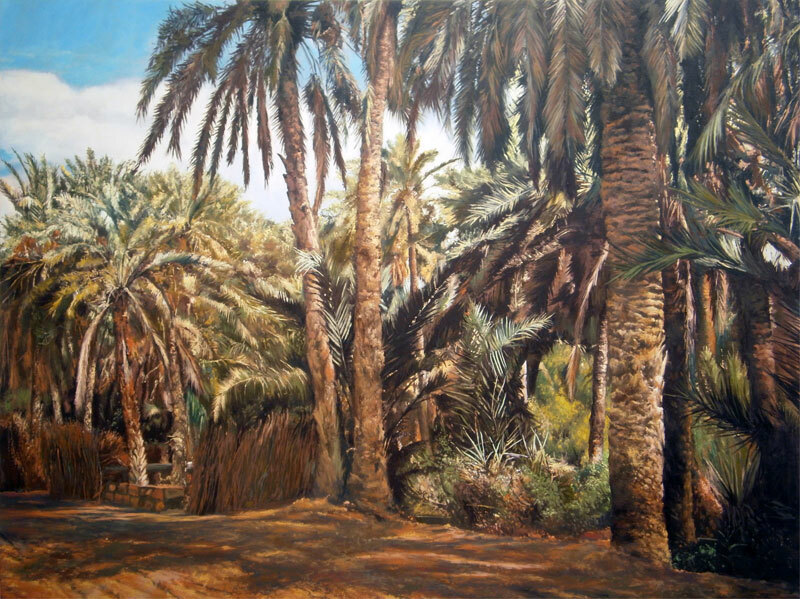 He has chosen photographs from publications of the nineteen-seventies and -eighties that promote the development of the Middle East as models for his latest large-scale paintings. He paints a more abstract, mysterious composition by removing all figures from the photographs and reframing them. The viewer is then prey to a feeling that an elusive psychological presence remains within the work. Michael Ashcroft paintings explore the setting of an idealised world, in which political design always draws upon the glory of nature. He recreates the clichés that beseech our cultural presumptions and in doing so overthrows our trust in integrity. Ashcroft’s process of using the glorified landscapes of vintage books and pamphlets began in 2001 with his idea of subverting “sublime” views into politically-charged topographies. The artist understands landscape painting as a system of conventions and ideologies ordered in such a way as to suggest its embedded contradictions.